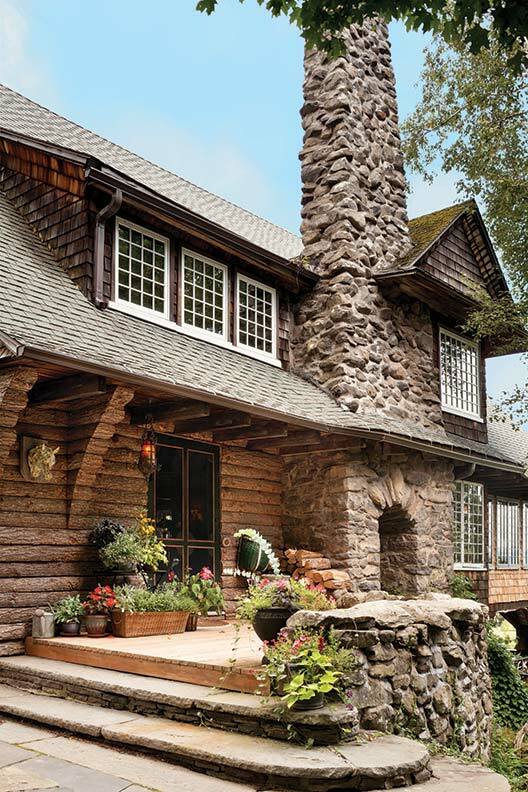 Built at the very end of the Victorian era, the bark-on-log and shingle house is in the rustic style of the Adirondack Great Camps. 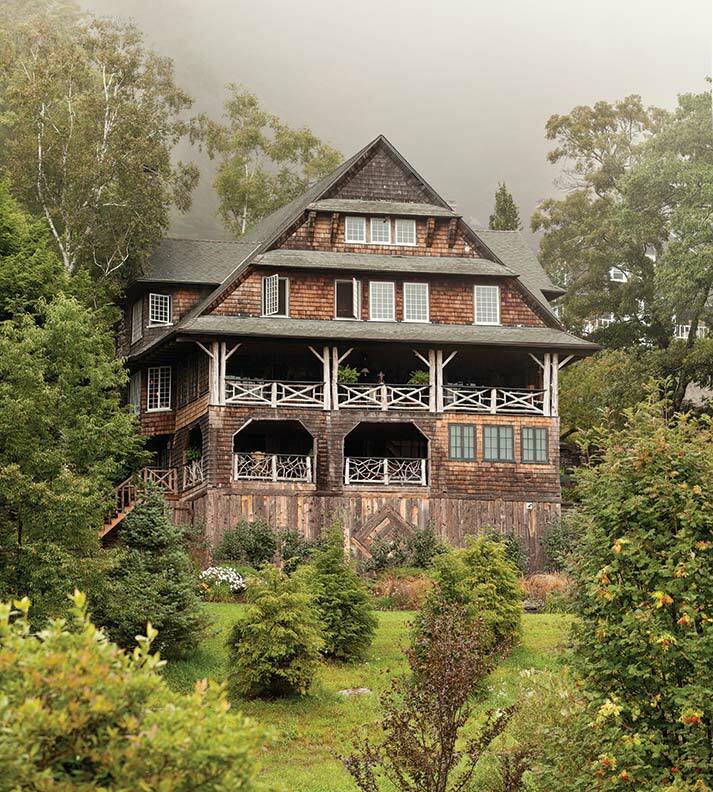 It nestles in amidst the misty Catskill Mountains. Unlike so many Victorian houses, the interior of this vacation camp is informal, open, and spacious. The house was built to be solid, with a full foundation and a sturdy roof—not always the case for summer homes in the Catskills. This mountaintop house, said to be one of the best unaltered examples left in Onteora Park, nevertheless was hard to appreciate at first glance. It was hidden by a tall hedge and tumbledown fence. 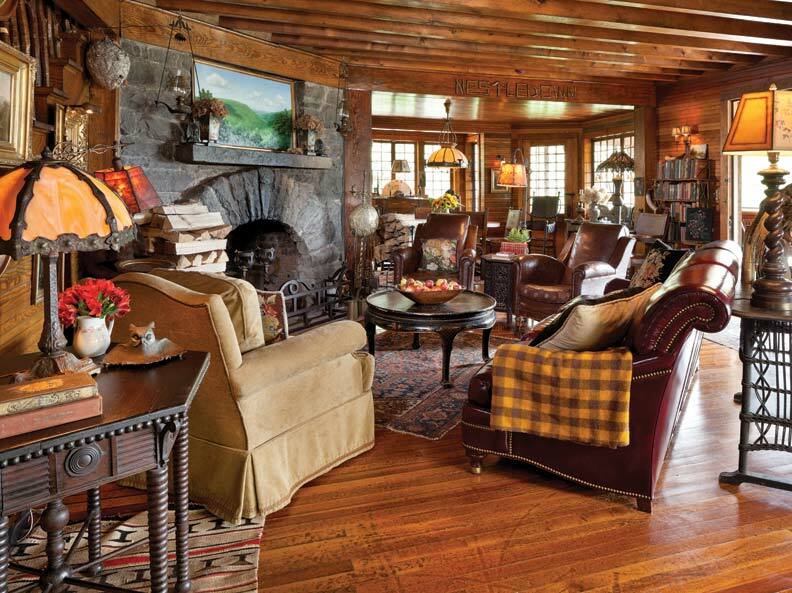 When Lynne and Steve Foote first heard about the house for sale in this historic community in New York’s Catskill Mountains, they were intrigued. Mostly for the good, it stood hardly changed since 1902. A multi-gabled roof sheltered quaint dormers and eaves; its three-story fieldstone chimney anchored the southern end of the home. Broad living porches ran across the eastern façade, opening to spectacular views of High Peak and Round Top mountains—vistas that the city-bound Foote family yearned for. Its charm seemed irresistible. The original fir woodwork had never been painted; black with age, it needed just a good cleaning and a renewing coat of linseed oil to bring back the mellow golden gleam. Previous owners had replaced some of the windows and doors—but they stored the originals underneath the house, ready to be reused during renovation. Upstairs and in the garret, multiple bedrooms were available for the couple’s children and frequent guests. Fieldstone fireplaces and a stone arch in the entry had been painted white, so these were painstakingly stripped. A missing window seat was reinstalled in the living room. 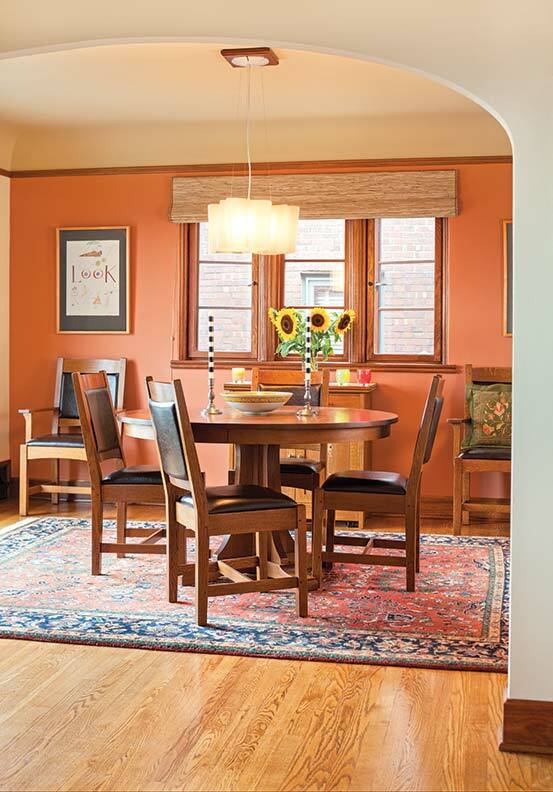 Restoration designer Dave Maurer tracked down a cache of vintage Bradley & Hubbard brass wall sconces, complete with iridescent Steuben glass shades, which now cast glowing circles of light in the rustic interior. The living room opens to the dining room behind. Casual seating clusters around the stone hearth, where fires burn on cool nights, even in summer. The house’s lower level had been a warren of unused and unfinished spaces, originally intended for laundry and servants. Dropped ceilings and Sheetrock walls were removed, replaced with tongue-and-groove wainscoting and ceilings consistent with the house. The lower level has been repurposed as a guest bedroom, office, bar, and family room. 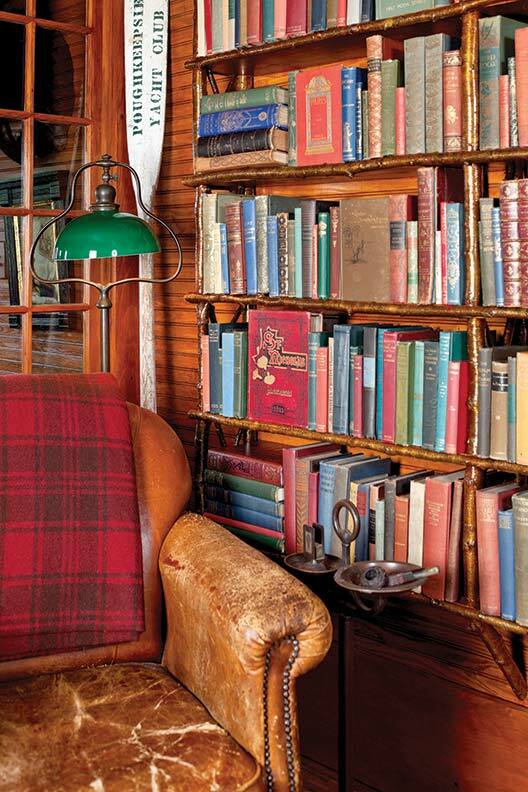 The family room and bar have the appeal of a 19th-century gentlemen’s club, with vintage sports paraphernalia and old books lining bookcases made of birch branches. The family gathers together for meals—and Lynne loves to cook. 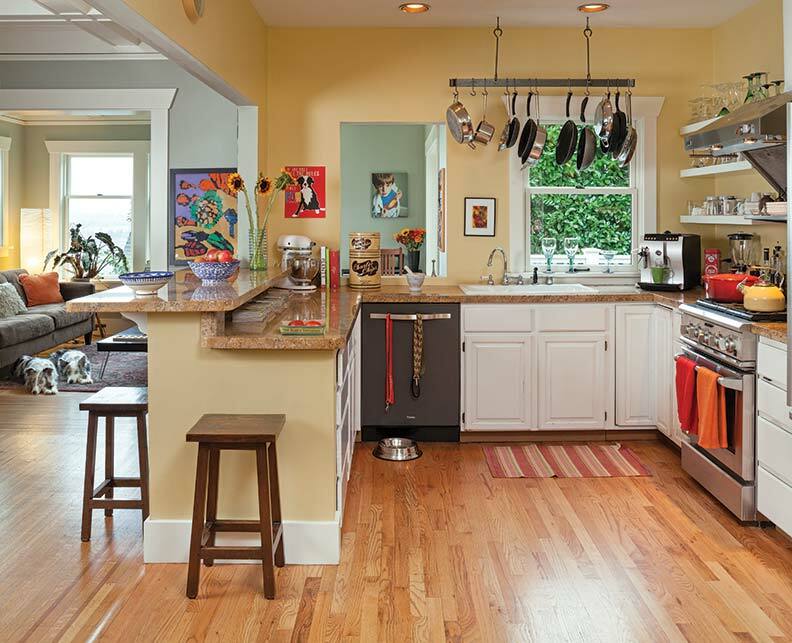 A more serious kitchen was a priority in the renovation. The existing kitchen, a cramped space at the rear of the house, was doubled in size by absorbing a small bedroom and removing a servants’ staircase. In the new kitchen, which includes a pantry and eating areas, the house’s age and character were reinforced. Salvaged elements were used whenever possible: 19th-century fir flooring salvaged from Bennett College in Millbrook, New York, replaced mismatched floors; windows were rebuilt and some reglazed with old glass; vintage hardware and lighting fixtures were installed. Informal fir cabinets are set off by a copper sink and backsplash. Modern appliances, including a dishwasher, refrigerator drawers, and a freezer, are hidden behind tongue-and-groove fir panels. 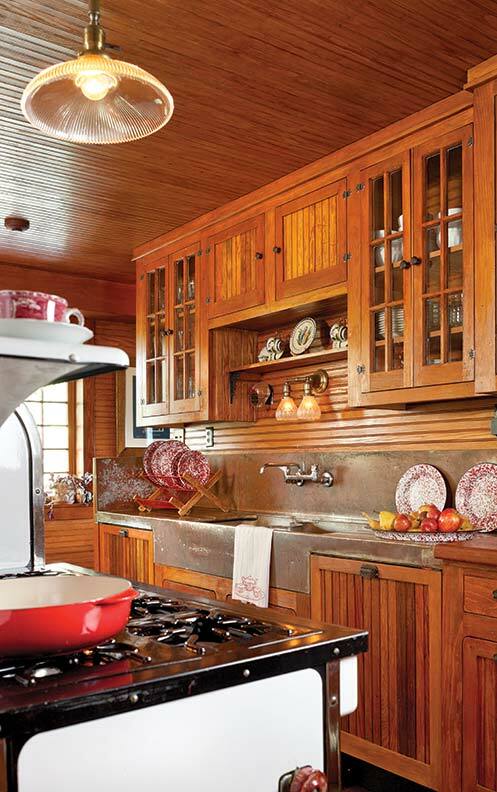 The rebuilt 1930s Magic Chef stove is the heart of the kitchen. The large kitchen is relatively new. Its rambling layout, well-matched fir beadboard, vintage stove, and copper sink make it look original. The porches, too, have been restored to their original look. Down came modern railings made of pressure-treated wood, which were replaced with rustic log rails and twig-work set into cedar posts. Furnished with mismatched antiques and lit by flickering kerosene lamps, the upper porch soon became an outdoor dining room. From here the family watches the sunset display of lavender and gold, and the moonrise over dusky blue peaks. The original name for the old house was Highways, a reference to its mountaintop setting, but the interstate system has stolen that word’s evocative appeal. So the Foote family rechristened their home Nestledown, appropriate to their feelings for the place and an allusion to the Long Island home of textile and interior designer Candace Wheeler, the founder of Onteora Park. 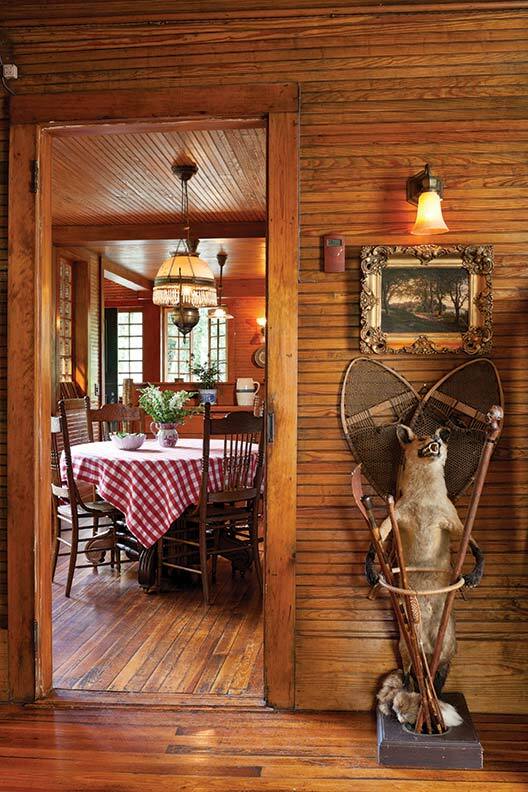 The rustic lodge has indeed become a place for nestling down to enjoy nature and the simple pleasures of the past.